In dialogue we are practising listening three ways, which can seem quite hard at first, but with awareness and practice becomes possible. Firstly we need to tune into and listen to ourselves. This includes sensing any emotional responses to what is said in our bodies; Our emotions are felt before they are thought and it is often something that is overlooked. Our bodies give us the first sign of how we feel about something; do we have a tight nervous sensation in our stomachs, do we feel nauseous, has our heart started beating faster, do we feel tense? Once we begin to notice these physical sensations we can start to learn the language of feelings to name them. This takes some practice; sometimes we don’t feel anything. We can use our breath to connect us to our bodies, searching within for subtle signs and exploring them. Perhaps what we thought was anger is actually pain. Don’t forget that it is also possible to conjure up emotional sensations by recalling past experiences and feelings so, whilst it is important that we notice these too, we can bring awareness to whether it is something felt in the present moment or a consequence of some past thought or feeling. Once we have become more in tune with our emotional and physical responses we can bring our attention to our minds. Can we inquire into why it might be that what is being said or happening right now is causing these sensations. Can we trace our thinking back to similar past events or words. Or bring understanding to past experiences that may have developed certain learnt behaviour or habitual thought patterns. What is the tone of the voice inside our heads? Is it our inner critic putting us down or a more compassionate, kind and understanding voice. Often we don’t notice our inner narrative; there are many voices in there, as there are many facets to ourselves. It can be helpful to name them and make friends with them; you don’t need to cast your self-doubt aside but perhaps give him or her a hug. Once we give light to all the elements of ourselves we can better see what lessons they have to teach us, or what needs they might have to become a better version of themselves. Learning to listen to ourselves can be one of the hardest elements of a listening practice; sometimes we don’t want to listen to the chatter in our heads; we find constant distractions to keep us from those voices; the what ifs, the buts, and the if onlys. We don’t need to tackle them all at once, you are on a lifelong journey, and one that is flowing in constant change, so be gentle and take steps towards knowing yourself a bit better each day. There are many ways to explore ourselves but noticing is a good start. Notice what makes you happy, what makes you feel most alive, or what makes you sad or angry. All feelings are welcome, and are in direct relation to our needs, whether they are met or unmet needs. Learn to pause, take time and reflect. Notice what you are feeling moment to moment; emotions are fleeting so give them space and as you come to observe them they will start to change: no one can stay angry forever, and we all know happiness is fleeting. All emotions are an expression of life, so we don’t need to judge them as good or bad, just accept that they are there, and learn to be with them. If we don’t allow the flow of emotions they will find somewhere to settle in our bodies, festering, ready to surface at the most inopportune moments, where we still might not understand them. When we think about listening to others there are a few things to consider first. 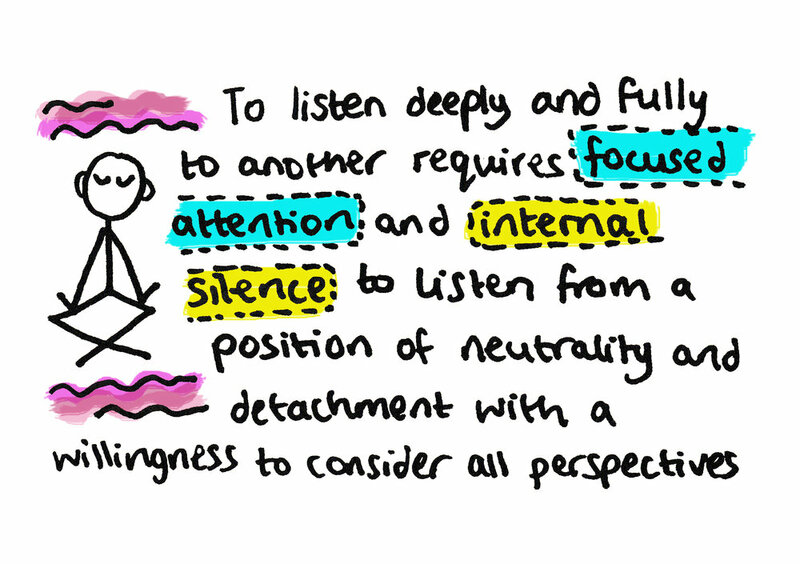 What is our intention for listening? This might sound strange but actually why is it that you want to listen to this person? Do you even want to listen to this person? Do you think they have something of value to say? Do you need something from them? Do you think they should be listening to you but you don’t need to listen to them? Or do you simply want to honour and respect them as a fellow human being and listen with the intent to understand and connect with them. Once we have given some thought to our personal intention we also need to give thought to what the person or group we are listening to needs. Do they just need to make sense of their own thoughts by speaking them out loud. People speaking their problems do not always need a answer, advice or solution from us, in fact, sometimes that is the least helpful thing we can offer them. Maybe they just need the silent acceptance of another human being to hear them and see them for who they are and what they are experiencing in the moment. This of course requires that we are able to suspend our judgement of whatever it is that person is saying, so that they feel open and secure to really speak what is true to them. Practising non-judgement is an essential part of listening to understand, both for ourselves, as we are often our harshest critics, but also for other people. If you have ever been listened to fully, without judgement, you will know that it is a beautiful, liberating feeling. Listening without judgement does not mean that we will never get to a point that we make a judgement, but it means that we are able to hold that judgement lightly, and really inquire into what is being said, with curiosity and empathy. There is a dance that plays between us when we speak; someone says something we don’t like and we feel our defences raising, ready to jump into action; to attack or defend. Can we stop to notice and inquire into what has caused this reaction? Or perhaps what the person is saying has got us all excited, we can’t wait to jump in, interrupt and say our part. Either way, it is essential that we practice a slow form of communication; one that gives spaces for these feelings to settle and the causes to emerge, to strengthen our understanding of ourselves within the context. There are of course other reasons why someone may need us to listen to them. Perhaps they do indeed need something from us, maybe they need us to mirror back to them what it is we have heard; so they can feel listened to and understood. Or maybe we have some vital knowledge that they need, in which case, have we given them enough time and space to ask the vital questions. Are we delivering knowledge or are we exchanging it? It is also important that we take into considerations the conditions in which we listen, both in ourselves and our environments. Do we listen well when we are stressed, hungry or in a rush? Do we listen well in a noisy room full of distractions? Can we make an assessment on how these might affect the levels of listening required and suggest we move to a different location or speak at another time. Finally there is listening to the group. This means listening to the flow of meaning that is emerging from our collectives voices and thinking. When we are in a successful dialogue, this flows naturally from one voice to another, building or reflecting on what is being said until we start to build a picture of what the group thinks and feels on a particular topic. As each voice, experience and insight is added, we start to see things with fresh eyes and new perspectives. We start to transform. When we are speaking and listening to the group there is no real need to speak at or to one another, because we are speaking together, speaking to the meaning that is forming at the centre of the circle. A collective intelligence begins to form in the circle, and it is this intelligence that can give us insight and understanding to complex problems, can answer questions that seemingly had no answers, and can provide direction for taking next steps. That is not to say that when communicating together this way we will not experience or feel disturbance. What is being said may create emotions that conflict with our feelings and beliefs. It is important in a dialogue to accept that our opinions and beliefs are assumptions, based on our experiences, and that we each have a unique set of experiences that have shaped us. There is value in all our experiences if we can share them with the spirit of fellowship and trust. We can learn to live with our differences because we have come together in our humanness. We can discover understanding, where previously there may have been anger, indifference or frustration. We begin to realise what is lost when we lead from the instant judgements of someone; that person doesn’t look like me, doesn’t sound like me; couldn’t possibly relate to me. What we gain from communicating with each other in this way is a feeling of connection and a sense of what it means to be truly human. We don’t necessarily all have to be convinced to have the same view but we can come to a coherence and shared meaning of our collective views.We are a reflection of Mother Nature; with the vastness of her diversity, we are also diverse in our beliefs, likes, dislikes, cultures. Mother Nature is an ecosystem-each plant and animal has their role to play to maintain balance and harmony. So when listening as a group we can take inspiration from Mother Nature, tune into our intuition, listen deeply from our bodies, hearts and minds and allow our collective intelligence to emerge from the centre.